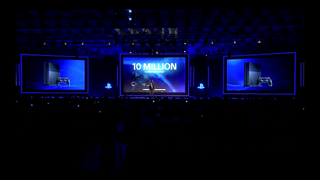 Sony has sold 10 million PlayStation 4s. They don't know why. It just kinda happened. Sales appearing from the ether—that sort of thing. The 10m sell through in the first nine months is well beyond what we had hoped for. As you know, we have struggled to keep up with demand of PS4 for so many months. It was hard to find and purchase PS4. Now we are able to supply units so in every territory I believe you can find PS4. So we just managed to catch up with demand. It's just beyond our imagination. We are so happy. But I for one am a bit nervous because we do not completely understand what's happening. You need to understand why your products are selling well so you can plan for the future, right? It defied the conventional thinking. Lots of people thought the dedicated game hardware might not be needed going forward, but still lots of people are very excited. When you see the new games coming out and being announced this E3 and Gamescom, I think there's a good enough reason for a gamer to believe this is something worth investing in. It's a fascinating concern. Yoshida goes on to add that their marketing data shows a high percentage of current PS4 buyers didn't actually own PS3s—or, really, any last-gen hardware. This would imply that those people weren't big console gamers until the fourth PlayStation came out last November. So where the heck did all of these new PlayStation fans come from? As soon as we see a great sales number, our instinct tells us we should be concerned about future sales, right? Are we exhausting all the core gamers? If we sell this number of units, there are no more consumers we can sell to. That's a really terrifying prospect. So we want to understand who are these consumers who we do not necessarily consider core gamers, who are purchasing PS4 and why they are doing it and what they are doing with PS4, so we can create a bit more of a positive future, rather than saying, wow, we have sold to every single core gamer. So that's what we are doing. Help Sony out, folks. If you bought a PS4, tell us who you are. Are you a PC gamer who converted to the console faith? Are you a longtime PlayStation fan? Did you skip a console generation or two? Are you a brand new gamer? Were you summoned to this earth for the purpose of bolstering Sony's sales, a mythical PlayStation fairy conjured up to participate in bloody console warfare? Let us know.